Briefly, which product development processes are enhanced in Windchill 9.1? How does Windchill 9.1 fit within the PTC Product Development System (PDS)? What services are available for getting Windchill 9.1 solutions rapidly into production? What training will customers require with Windchill 9.1 and where can I get additional Windchill 9.1 training information? How can I learn more about Windchill 9.1? Windchill 9.1 offers improved support for key product development processes, plus a range of improvements in enterprise product content management, usability, and supportability. Manufacturing Process Management (MPM). With Windchill 9.1, PTC improves the capabilities of Windchill MPMLink through the addition of out-of-the-box integrations to SAP and Oracle ERP systems, support for alternative bills-of-materials, and a new Gantt explorer for viewing/analyzing process plans and for exporting this information to Microsoft Project. Windchill 9.1 introduces “packages” which enables users to create, deliver and track packages of Windchill managed information, allowing offline Windchill information access to partners outside your Windchill system. Additionally, Windchill 9.1 adds a remote vaulting capability to its files servers, meaning locally created content can be housed exclusively in the local file server without needing to be transfer to the master server. Design efficiency has been enhanced with improved Pro/ENGINEER data management, and support for Heterogeneous Design-in-Context (HDIC). These HDIC improvements allow users to incorporate Unigraphics NX and CATIA V5 designs managed by Windchill PDMLink directly into their Pro/ENGINEER designs. Additionally, Windchill 9.1 offers expanded support for ECAD data management as well as ProductView ECAD Compare and ProductView Validate, enabling unique, standards-based ECAD-MCAD collaboration. Windchill 9.1 introduces several enhancements for change management, including support for mass change, and a new change summary report. 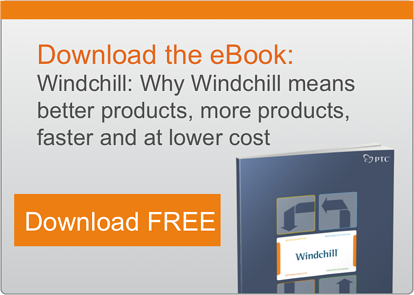 Windchill is a core component of PTC's comprehensive Product Development System. It enables manufacturers to have a single repository capable of controlling all product information and to optimize key product development processes. With its integral, pure Internet and interoperable architecture, PTC's Product Development System can be deployed quickly, offering a reduced total cost-of-ownership and lower risk of technological obsolescence over time. Get more information on the PTC Product Development System. Briefly describe the usability and supportability improvements of Windchill 9.1. Windchill 9.1 offers a host of usability improvements designed to make navigation and usage smooth and intuitive. Specific examples include column freeze and column resize. Windchill 9.1 also simplifies deployment with a much improved installation procedure. This update requires no data migration and is intended to greatly streamline the process of moving from Windchill 9.0 to Windchill 9.1. PTC Global Services provides a blend of strategic process consulting, system implementation services, and a unique education approach to help leading companies realize the full value of Windchill. These activities have been integrated together and executed using an innovative Realized Value Methodology, a collection of best practices and lessons learned from thousands of customer engagements to ensure that our customers realize the most value from their investment in the shortest possible timeframe. These assets are combined together into various standard solutions that are designed to meet the needs of a particular business process, industry or implementation stage. PTC has a role-based curriculum; therefore the amount of training that customers will require depends on the role they perform. The complete list of role-based learning paths for Windchill 9.1 is being finalized and will be available here. The PTC training section contains much of the information on training, including links to PTC's Learning Management System, and PTC University. If you are a current PTC customer, please contact your PTC sales representative for more information. For additional information available online, please visit the Windchill product page.